Today, December 9th only, head on over to Amazon where you can save over 50% on select Contigo AUTOSEAL Stainless Steel Insulated Travel Mugs – no promo code needed! These travel-friendly mugs are both leak-proof AND spill-proof and keep drinks hot or cold for hours! They can also be used with one hand and fit in most car cup holders. 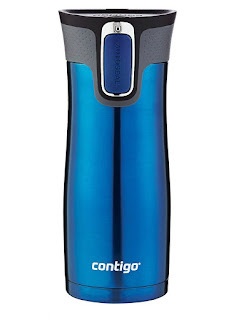 As just one deal idea, you could snag a Contigo 16oz AUTOSEAL West Loop Vacuum Insulated Stainless Steel Travel Mug with Easy-Clean Lid in Black, Monaco, or Stainless Steel for just $8.99 (regularly $20.99)!